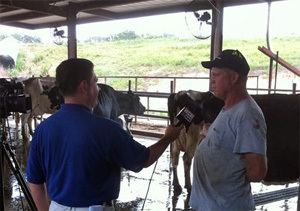 A reporter from WCBI-TV came to our farm this afternoon to interview my father and I about the effect of summer heat on milk production. You can read his article or watch the video (story begins at the 8:18 mark) from the station's website. Most of what he included from the interview served to support the story he was shooting for: summertime milk production and its impact on retail dairy prices. In reality there is much more to that relationship than simple supply and demand, but to even begin to explain the complexities of milk marketing would require more time than a reporter is going to be allotted during a half-hour local newscast. Summer is our toughest time of the year financially with less income from milk sales and higher expenses due to growing feed. It's like this every year though, so we manage our business throughout the year with that reality in mind. during the summer. These will calve in mid-September . Since production does decrease in the summer, we manage our herd to have the fewest number of cows milking in July and August. 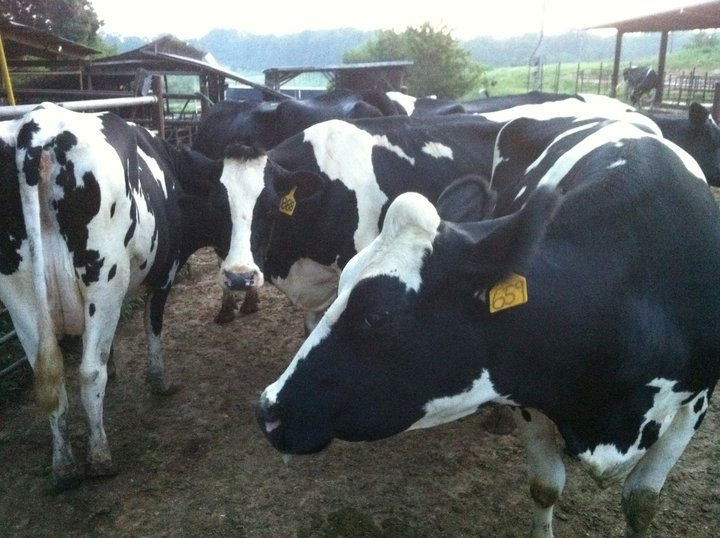 Doing so allows us to have the most cows milking when the weather is more favorable for production. My answer about dairies facing credit availability problems dates back to the milk price crash in 2009, though I'm not sure if the situation is still as dire today as it was two years ago. Fortunately, we've always maintained a good relationship with our local bank and credit has always been available when needed. I really do believe the long-term outlook for dairies is positive. It may take us a few more years to fully adjust our business model to the new reality of feed, fuel, and fertilizer costs being much higher than ten years ago, but we'll get there. As long as we can continue to grow demand for dairy products both domestically and worldwide, there will always be a need for dairy farmers. If you watch the story, please leave a comment and let me know your impressions. I watch stories about my industry as a dairy farmer, so I always need to get the thoughts of consumers to help me expand my own perspective. So, what did you think? The past few days have left no doubt that it is indeed summertime in the Deep South. The highs have been in the upper 90's with heat indexes touching 110, and evening/early morning "lows" have been in the mid-70's with air so thick you could cut it with a knife. Our milking cows are spending most of the daylight hours trying to escape the misery by taking refuge in our barns, but even the fans and sprinklers can't keep their appetite and milk production from slipping in this kind of weather. This is not a new problem though...summertime is always tough on the cows and some weeks (like this one) are a little worse than others. The hot weather hasn't been too bad for our crops, though. Our corn, sorghum, and bermudagrass all grow well in the heat as long as we have adequate rainfall. After a dry May and first half of June, we've been getting a little rain each week so our crops are looking pretty good. In fact, our rain chances lately have been high enough to keep us out of the hayfield until this weekend. After cutting half of our hay acreage this weekend, we baled 23 acres today and will do another 10 tomorrow. The current rain forecast looks like we won't cut the rest until first of next week, and we'd be happy to wait until then if we knew we could get an inch or two of rainfall between now and then. Here's a quick farm update for you to enjoy on this 4th of July Weekend. Cows: A few dry cows are finally starting to calve, but we have still been drying off milking cows at a faster rate. We currently have 163 cows in the milking herd, the lowest number we've had in quite a while. The dry-off to freshen ratio should be nearly dead even for the next six weeks, so where we are is probably where we'll be for a while. Corn: I made the last sprayer pass through the cornfield a week ago, so we shouldn't need a tractor back in the creek bottom until it's time to harvest. I checked it yesterday and it's looking really good. The corn itself looks healthy (and is growing fast), and their doesn't appear to be much weed pressure. A few more good rains over the next couple of months will go a long way in making it a great silage crop this year. Sorghum: I've spent most of this week spraying and planting sorghum fields, and I've only got 24 acres left to plant. Even though this crop is being planted a couple of weeks later than what I had hoped for, it's still a week earlier than our last sorghum crop in 2009. We had a good yield that year, but lots of September rain made it very difficult to get equipment in the field when it was time to harvest. Hay: After we fertilized our bermudagrass in early May, it stopped raining. No rain = no growth. We have received a fair amount of rain over the last two weeks, though, and the bermudagrass has finally responded. If the weather forecast allows for it, we'll probably try to harvest 35 acres next week. We'll need really good growing conditions over the next couple of months to be able to make up for our slow start, but thankfully we'll go into the winter with some hay carried over from last year. For your viewing pleasure, there's a new GDF MooTube Minute below that talks about some of what I've blogged about above. God Bless America and I hope you all have a wonderful holiday weekend!